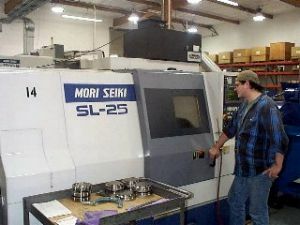 In the lathe department we have sized our Mori Seiki machines to manufacture a large range of parts from very small bushings to large castings and forgings. Our smallest machine is an SL-15 equipped with an Iemca bar feeder capable of handling bars 1.625" diameter and up to 14 foot long. 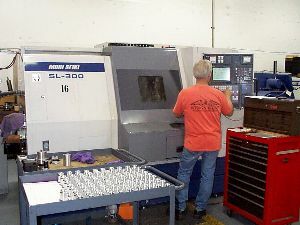 The SL-300 is our largest capacity machine. It will turn up to 17" diameter and in addition, has a parts catcher enabling the machine to run smaller parts from bar stock as well. The SL-200 is our newest machine and is also equipped with a parts catcher. It has two spindles and will turn up to 16" diameter and bar stock up to 2.625" diameter. 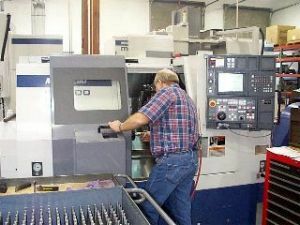 The SL-25 is a medium sized machine capable of turning a large range of parts. 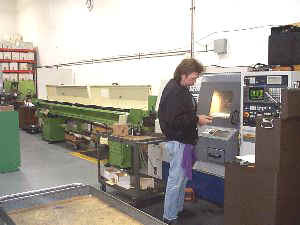 Equipped with parts catcher and Iemca Boss 542 bar feeder. Bar length capacity 14'.